NB: This article has information about Paris for the end of 2011 and the beginning of 2012. * For a guide to the archaeology in Paris, click here. * For up-to-date information about temporary exhibitions in Paris, click here. The in situ archaeology of Paris may very well be restricted to the Roman and more recent Medieval periods; the Roman baths beneath the Hôtel de Cluny, said to be one of the most outstanding examples of Medieval civic architecture, immediately spring to mind. But, Paris stands above all other European cities in one respect that makes the French capital an archaeo-phile’s dream destination all year round. Long after most of the archaeological sites have closed for winter, the archaeology on offer in Paris continues to be impressive. Not only does Paris have an incredible choice of permanently displayed collections in the museums around the city, but also there are always not-to-be-missed temporary exhibitions in the numerous museums and art galleries that draw on collections from within France and beyond. The fall-winter season for 2011/12 is set to be as interesting as ever, and will not disappoint. For anyone travelling to Paris during the next four months or so, the following are just a handful of my recommendations of what is available. 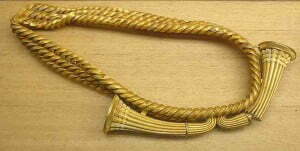 Bronze Age gold belt from Guînes, now in the Musée d'Archéologie Nationale. ©Siren-Com, Wikipedia. The national museum of archaeology, in Saint-Germain-en-Laye just outside of Paris, has one of the richest collections of gold artefacts from the European Bronze Age in France. One of the highlights of this collection is a belt (photographed to the right) that was made sometime between 1,200 an 1,000 BC and found near a town called Guînes in the Pas-de-Calais Department of France. With over 300 objects, some as spectacular as the golden belt and other perhaps a bit more ordinary, this temporary exhibition explores the use of bronze and gold in the everyday life of people during the period in prehistory we call the Bronze Age (2,300-700 BC). The exhibition begins with reconstructions of three of the main burial rituals, exploring the religious and symbolic aspects of various funerary objects. Other displays include more mundane but no less fascinating aspects of Bronze Age life, including dress, tools, ceramics, metallurgy, and trade. Of Bronze and Gold: the Bronze Age in France at the Musée d’Archéologie Nationale ends 30 January 2012. You might think there are already enough art galleries in Paris, and given that the last ‘new’ one opened about 30 years ago that there is not much room for yet another. But this is not so. Following a series of temporary exhibitions (including the terracotta warriors from China in 2008, the Inca’s gold during the fall an winter of 2010), the newest kid on the block, the Pinacothèque, opened its doors earlier this year with a series of exhibitions of art from eastern Europe. The latest temporary exhibition brings together both art and archaeology – and perhaps gives strength to the idea that there is not much that separates the two anyway. To say that the sculptor Alberto Giacometti fell for the Etruscans is not that far from the truth. Following a 1955 exhibition of Etruscan art in Paris the artist was hooked and travelled to Tuscany to learn more. Many experts now feel that Giacometti’s sculptures, certainly his lanky stick-like figures, can not be fully understood without reference to the Etruscans and their artistic traditions. For Giacometti fans, this exhibition is expected to be one of the best of the sculptor’s work in over 50 years. For archaeologists, not only is this an opportunity to see over 150 Etruscan objects, but also to observe how one modern artist has been inspired by ancient art and cultures; alongside the wonderful range of Etruscan objects are thirty of Giacometti’s iconic sculptures. Giacometti and the Etruscans at the Pinacothèque ends 8 January 2012. Today we are still surrounded by so much from the Roman period, and I do not mean how much of our supposedly modern lives are heavily influenced by Roman traditions. Through much of Europe we see a lot that is Roman, even in the bigger cities that have witnessed nearly two thousand years of successive development, there are the walls, the theatres and amphitheatres, the baths and temples. And often these are in relatively good preservation. What we see less of is the private house. Yes, there are the foundations of numerous Villas scattered about what was the Roman Empire, but were it not for the archaeological sites of Pompeii, Herculaneum, Oplontis and Stabiae, and the eruption of Vesuvius in 79 AD, we would know very little about the private domain during the Roman period. Pompeii, an art of living explores Roman art in the context of the Roman house. Frescoes, sculptures, pieces of furniture and other items from everyday life from Pompeii and nearby sites during the first century make up the 200 objects that are used to recreate the interior of a Pompeiian house, with its atrium, triclinium (formal dining room) and culina (kitchen), and the peristyle around the garden. The range of objects included is truly stunning, and the very concept of the exhibition is innovative, even if some of the objects are well known and frequently illustrated. It is a bit like walking through a period drama set. Pompeii, an Art of Living at the Maillol Museum ends 12 February 2012. 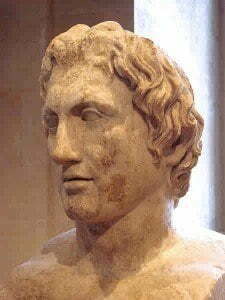 Roman copy of a statue of Alexander the Great by Lysippos, Louvre Museum ©PHGCOM, Wikipedia. With close on 500 objects, many of which have never been seen before in France, this temporary exhibition, one of many at the Louvre, retraces the rise of the kingdom of ancient Macedonia from the fifteenth century BC. In 1977 archaeologists unearthed a series of intact tombs in northern Greece, which turned out to be royal tombs – one belonging to Philip II, father of Alexander the Great. Artefacts from these and other tombs are brought together in this exhibition to reveal the splendor and development of Macedonian art. Through a series of chronologically ordered graves and associated grave goods, sculptures, vases, ceramics, jewelry and, in particular, two gold crowns that belonged to Macedonian warriors various aspects of this ancient civilization are presented, including artistic production, education, daily life of men and women, religion and death. Not surprisingly, a theme that runs throughout the exhibition is the most well known of the Macedonian rulers, Alexander the Great. 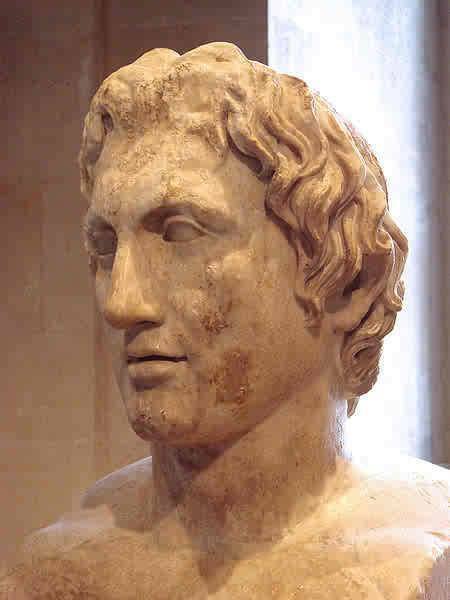 In the Kingdom of Alexander the Great – Ancient Macedonia at the Louvre runs from 13 October 2011 to 16 January 2012. In what is being described as an unprecedented cooperation between the Louvre and the Imperial Palace in Beijing, between France and China, a temporary exhibition about to open at the Louvre will present 130 objects that tells the story of the Forbidden City. The majority of the objects come from the Imperial Palace Museum, and this will be the first time many of these have been seen outside China. These objects include paintings, vases, ceremonial costumes, and military uniforms, and are displayed chronologically, following the order of succession of Chinese rulers from the 13th to the 19th century. What is particularly interesting about this exhibition and its setting in the Louvre, itself a Royal Palace for many centuries from as early as the 12th century, is that for each period in the development of the Forbidden City, the cultural and political exchanges that existed between France and China are explored. The Forbidden City, Emperors of China and Kings of France at the Louvre, will open to the public on 29 September 2011, and end on 9 January 2012. Of archaeological sites in Paris, the heavily restored Roman Amphitheatre is free of charge, and open during the day during winter. The Roman Baths can be seen from the street, but can also be visited via the National Museum of the Middle Ages.